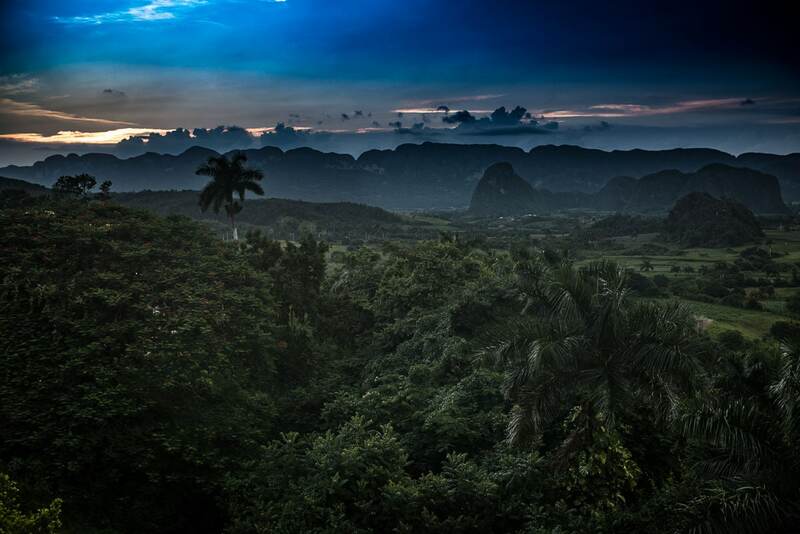 Sunset at the Viñales Valley. The Viñales Valley of Cuba is designated as a UNESCO World Heritage site because of its natural beauty, its unusual geology, and its history as a cultivated landscape for centuries before the arrival of Europeans in the new world. The Viñales Valley is encircled by mountains, but its most unusual feature are its mogotes, limestone outcroppings that arise abruptly from the flat valley floor, sometimes as high as 300 meters. The valley is still the site of traditional agricultural methods, particularly the cultivation of tobacco and fodder for livestock. Viñales is the center of the Cuban tobacco growing area. Because modern mechanical farming methods harm the quality of the tobacco, original methods are still used, especially using animals for cultivation. The landscape is dotted with homes and tobacco drying barns made of local materials, especially the thin pine trunks from which the province of Piñar del Rio gets its name. Thank you, Rosemary. I stopped by your page. I like your sketches very much.